We know in the hotel & travel industry that "User Generated Reviews", customer service and quality of the customer's experience are the main keys if you want to run a succesfull business. But does everybody know about Travel 2.0 and how to manage "User Generated Reviews"? I think not, let me explain a exemple with Ritz Hotel in Paris. - Remember, Travel 2.0 vision, it is all about the community, and where your "friends", readers and customers are! and Internet is all about multiple touch points with the potential customer! - "User Generated Reviews" technology is based on "Long Trail user reviews". To be simple, the game for TripAdvisor for exemple, it's to be in the Google index with the name of your hotel, and before you of course !!! - This trends are here to stay and you have to play with it ! Some title reviews, seems it's not "the perfection" and I don't see any hotel management answers ! "NOT Putting On The Ritz!" "Grand but worn around the edges lends to the feel of a palatial old mansion"
"Keep your Money and Stay away from the Ritz in Paris." "Worst Hotel I've Been To in My Life." Third, some simple solution(s) to manage "User Generated Reviews"
The hotel should work on their core business (customer service to make happy customers) and try to avoid negative postings. The hotel may use "public and free" tools, for exemple Google Alerts and Technorati or Sphere to monitor what is the online chatter about the hotel out there. The hotel has to monitor "User Generated Reviews" (web sites like TripAdvisor) and react if a negative review comes up. Conclusion Involve your users and customers in the discussion, get them to participate actively and they will market for you. 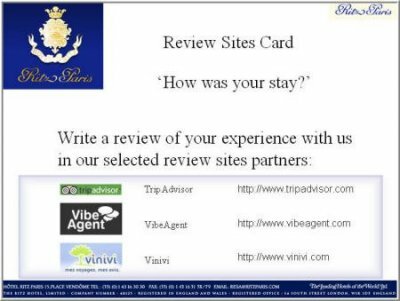 What do you think, any other ideas to manage "User Generated Reviews" in the hotel & tourism industry?